Rich and Indulgent. Made with West Country cream. 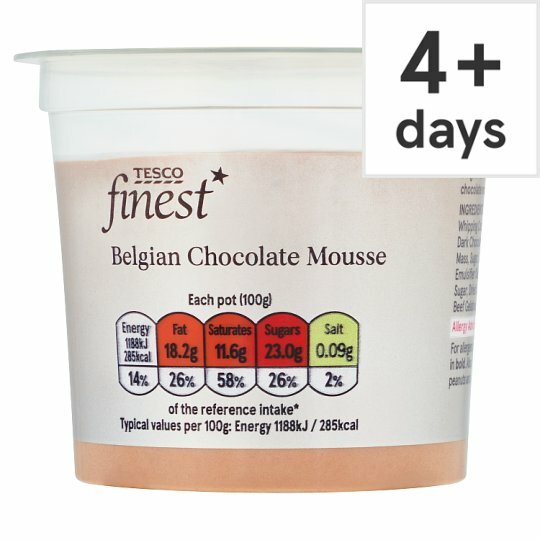 The best chocolate mousse is all about the quality of the ingredients. This one is made by experts in Devon using West Country whipping cream and rich dark Belgian chocolate. INGREDIENTS: Whole Milk, Whipping Cream (Milk) (25%), Chocolate (25%) (Cocoa Mass, Sugar, Cocoa Butter, Emulsifier (Soya Lecithins)), Sugar, Dried Skimmed Milk, Beef Gelatine, Tapioca Starch.